In honor of culture smorgasboard The Saboteur, the French and Irish mix, mingle, and defeat Nazis in this tres bizarre take on the classic Shepherd’s Pie. That’s right, I’m bringing fusion cooking up in here. I was joined by a very special guest “sous” for this post. That’s right, my mom dropped by! After a trip to the Marietta Square’s farmer’s market, mom and I whipped up some champagne mojitos and tackled this recipe together. By the way, we used a mojito mix from Mo’ Mint. Check them out! Since it’s a bit of a monster, let’s get started. 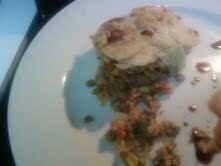 I’ve never made Shepherd’s Pie, so I turned to one of my favorite sources of inspiration: Alton Brown. If you would like to try your hand at a more classic rendition of this recipe, you can find Alton Brown’s complete version here. Hardware: Mandolin (optional, I just like it for the potatoes), 11″x7″ baking dish, micro-plane grater (if you are going to use a nutmeg seed), saute pan, and stock pot. Preheat your oven to 400(F). 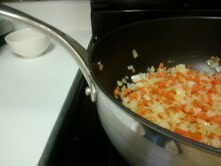 Place the canola oil into the saute pan and set over medium high heat. Give the oil some time to heat up, and then add the onion and carrots and saute just until they begin to take on color, approximately 3 to 4 minutes. Add the garlic and stir to combine. Add the lamb, salt and pepper. Brown and cook the lamb through, and then sprinkle with the flour. Stir that around to combine. This will soak up a lot of fat that the lamb will sweat out. After about a minute, add the tomato paste, chicken broth, Worcestershire, rosemary, thyme, and stir to combine. Might I recommend the fresh stuff? Bring to a boil, then reduce the heat to low. Cover the deliciousness and let that simmer for 10 minutes or until slightly thickened. Add the corn and peas, and spread the whole shabang into the baking dish. 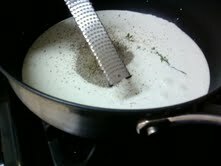 Place the cream in the stock pot and bring to a simmer over medium-high heat. Using a slotted spoon, transfer 1/3 of the potatoes with some of the cream to the prepared dish of Shepherd’s pie filling, forming an even layer across the top of the lamb mixture. A lot of cream still carries over with the potatoes, so the slotted spoon helped me control how much cream got into the overall dish. 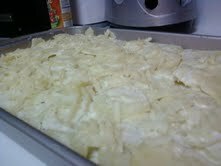 Top with 1/3 of the cheese, and continue layering the potatoes and cheese, ending with cheese on top. 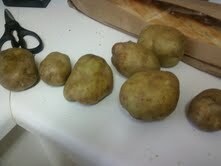 Roast the dish for about 30 minutes, or until everything is golden brown and bubbly. Remove to a cooling rack for at least 15 minutes before serving. I served mine with a small dash of Worcestershire on the plate. 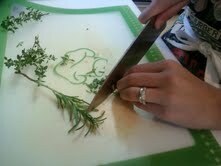 I really liked Alton’s use of the stuff, and the edible garnish just looked nice to me, too. Yep. Time for a new camera. Get ready to bare your teeth for the next review! This entry was posted in The Pies and tagged Alton Brown, cooking with ground lamb, French-Irish fusion cooking, Marietta Square Farmers' Market, Mo' Mint!, Potatoes au Gratin, Shepherd's Pie. Bookmark the permalink. Thanks for this recipe, I successfully made gratin for the first time last week and it was so nice I have had to restrain myself from having it everyday , today I thought I wonder if you could put that on shepherds pie ? 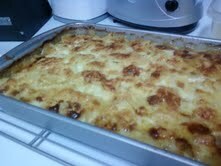 Your recipe looks delicous so I am giving it a shot tonight our bellies thank you !